I’ve been reflecting on consequence: how it’s owned, how it’s applied, and it’s role in engagement and trust. I’ve previously described a ‘sphere of consequence’, the notion that we each exist within a sphere, a bubble of consequence, part of which we project, and part of which is imposed upon us. Today, i just wanted to build out that notion a little further: the applications are significant. Firstly, organisations can only affect the external imposition of consequence, the ways they apply it, they cannot directly affect our own project of anticipated consequence (and hence our withdrawal from risk), secondly, our individual projection of consequence may not be calculated on multiple factors, sometimes conflicting, but almost certainly related to trust. 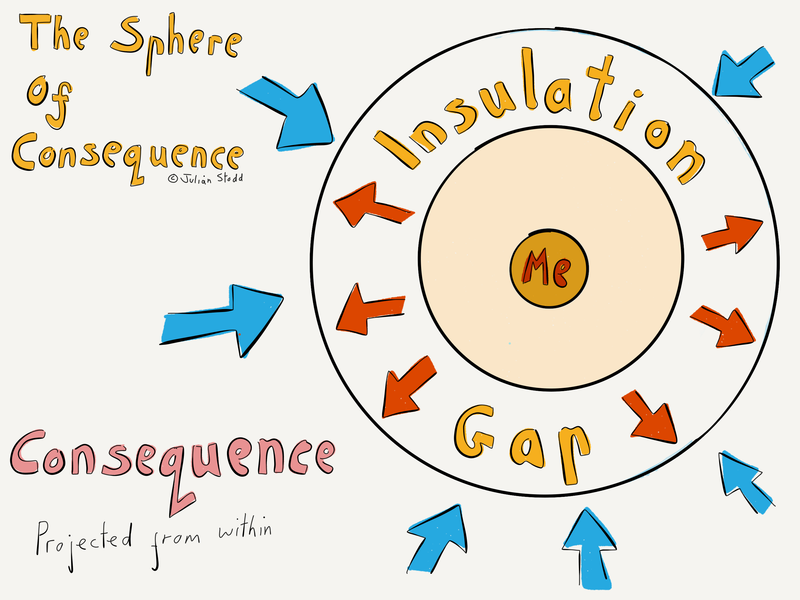 I also want to introduce the notion of an ‘insulation gap’, which represents the space between imposed, and projected consequence. To explore this in more detail, consider how we exist within that bubble: we sit inside it, and understand how consequence is applied. Some of this consequence is held in the rules of the organisation, it’s clear, break a rule, and you will be sanctioned. But other aspects of consequence are held within group behaviour and societal norms: if i push in front of someone in a queue, i will be judged as rude, and may even be sanctioned by the others in the queue, even though there is not official ‘rule book of queueing’. Perhaps i will write one… but in it’s absence, both the rules, and the judgement, are held in tribal knowledge. There is a complication around this: organisations may own formal rules, but they do not always apply them evenly. They use discretion, which is a good thing, but can lead to uncertainty, and uncertainty broadens the insulation gap. The second type of consequence is projected from within: imagine that we meet up and talk about our respective jobs. Imagine that you accidentally reveal a secret from your organisation, a juicy project that you are part of, but which you are not allowed to share. Then i tweet about it. You will be sanctioned, because in your sphere of consequence, sanction can be applied by the organisation. I, by contrast, will not, because my sphere is different from yours. I do not have the same relationship with your organisation, so my applied consequence is different. In this context, we tend to hold ourselves away from the hard edge of the sphere: we will be cautious rather than reckless, and the less predictable the organisation, the more cautious we will be, and the wider the insulation gap that we leave. In an organisation that heavily applies consequence, but does so somewhat unevenly, we will tend to trust it less, and hence behave with great caution: we build an insulation gap that is very wide. Simply saying ‘you can trust me’ counts for nothing: it’s the lived experience that counts. It’s like when organisations say ‘it’s fine to fail, it’s part of learning’. They often don’t mean it: what they mean is, ‘it’s fine to fail when we think it’s fine, but at some point, it will stop being fine and you will be sanctioned’, so the context and application of consequence is variable, and hence we step away from the hard edge. Consequence, it turns out, is complex. But also, a key driver of engagement, resistance, and trust. I think it’s valuable to consider the mechanisms by which we can make consequence explicit, and hence impact engagement, by reducing the need for a wide insulation gap. This can be done through behaviour, and through signposting. We can signpost spaces according to the type of consequence that is applied there: for ‘learning’ spaces, consequence should be low, whilst for ‘assessment’, or ‘performance’ spaces, it may be high. You can literally signpost it as red, amber, or green. But then the organisation has to stick by the rules: be even in application of consequence. That’s a much harder task to achieve, and leads into an understanding of social capital in Social Leadership, and the ways in which we earn trust (and specifically the way that trust is held in implicit contracts, a subject for another day). Organisations often assume that engagement will come if it’s asked for: they provide the technology, the assets, and the support, but they fail to address consequence. Look at whistleblowers, who report malpractice in the National Health Service: there is a hotline to call, a process to follow, and yet the reward for reporting malpractice is often bullying, hatred, and exclusion. The consequence is high, so people don’t report it. Why risk it? Just build a bigger insulation gap. This is equally true in other contexts, and is a key component in cultural failure: look at the Marines in the US, found guilty of sharing naked images of fellow female Marines. Did every individual in the groups involved feel that it was right: probably not, but the social consequence of dissent would have been too high. So they went along with it. This is how culture fails, even when most people within it don’t want it to. Consequence is complex, but a key factor in engagement, and a key challenge for Social Leaders to engage with. This entry was posted in Consequence and tagged Change, Consequence, Engagement, Insulation, Leadership, Sanction, Social Leadsership, Trust. Bookmark the permalink. Thanks as ever. 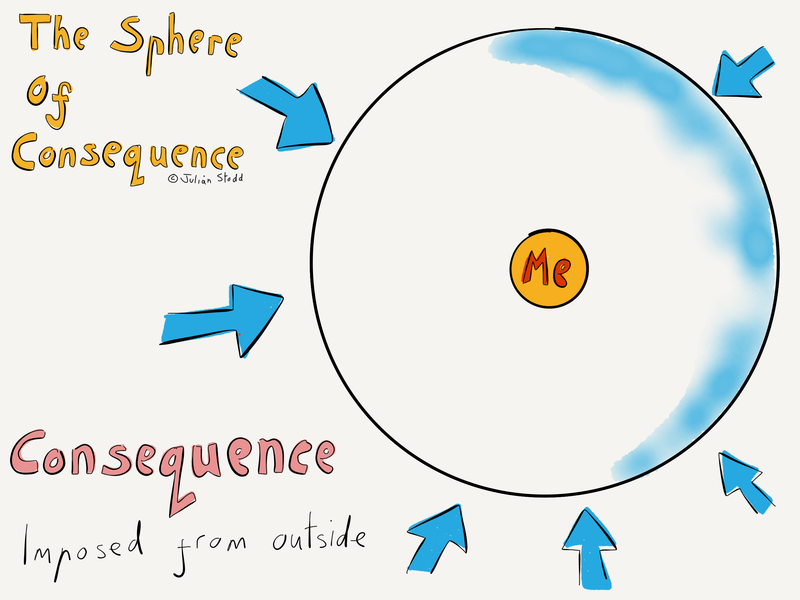 Your sphere of consequence model as usual made me think. But the assumption you’re working with is that all consequences are negative and that what’s going on in terms of consequences is that organisations and individuals are typically avoiding risk (which is always perceived as toxic waste, to be exported as quickly as possible across the nearest border). How does the model hold up for ‘positive consequences’ – for example those that might also be called opportunities for innovation? Or to take an internal example, those that arise from a team overcoming a particular challenge and reaching a new level of trust and cooperation?